I, the undersigned, A. C. Bhaktivedanta Swami, presently author of the following books: Krsna; Nectar of Devotion; Easy Journey to Other Planets; Isopanisad; Bhagavad-gita As It Is; Srimad-Bhagavatam; Teachings of Lord Caitanya; Krsna Consciousness: The Topmost Yoga System, do hereby appoint Rupanuga das Adhikari, Bhagavan das Adhikari, and Karandhara das Adhikari for the purpose of the publishing of manuscripts and literatures made by me, distribution and collection and all other necessary paraphernalia in this connection. 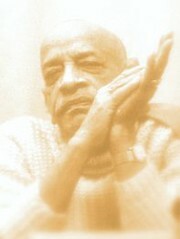 This trust is called the Bhaktivedanta Book Trust. Out of the three trustees, the majority decision will be carried. At the present moment, the Krsna books are coming from Japan and they should be taken care of immediately. The present procedure is that Sriman Karandhara das Adhikari is looking after the business and collecting the fund. The same procedure should be followed and whenever there is a collection, it should be deposited in my bank account entitled ISKCON, INC. - BHAKTIVEDANTA BOOK TRUST, number __ with the Security Pacific National Bank. And whenever there will be a new printing, on submission of the estimate I shall immediately advise the bank to remit as I am now doing. In the future, things will be done as it is necessary. All withdrawals are to signed by me exclusively. The Bhaktivedanta Book Trust account will be used to publish my books and literature and to establish Temples throughout the world, specifically three Temples are to be established, one each in Mayapur, Vrndavana, and Jagannatha Puri. I beg to inform you that this day, 29th July, 1970, I have remitted 16039.18 U.S. Dollars through Security Pacific National Bank, Culver City Branch, under receipt No. 729949 for credit of my account SS/F No. 2595 with you. This amount is for the purpose of constructing a Radha Krsna Temple at Mayapur, as it is contributed by my American disciples. Please acknowledge receipt, and on hearing from you I shall begin construction work. Please accept my blessings. I am in due receipt of your letter dated 12 July, 1970, and noted the contents. I have also received the pera and it is very nice. I know that you prepare everything very carefully for the Deities. You can offer the Deities as many varieties of sweetmeats as possible. I am very glad to learn that your training program is going on and the result is that now men are trained for opening and maintaining new branches. This is very much encouraging to me. So there are many things to be trained up and I am sure both yourself and Gurudasa are competent to execute them. So your program of study is very nice and regulated. Try to chant the mantras. It will not be difficult because the transliterations are there. In Los Angeles temple they are doing it very nicely every morning. Yes, I am glad to learn that the brahmacarinis are engaged in assisting work and cleaning. These are the most important duties for the brahmacarinis--namely cleansing. Caitanya Mahaprabhu personally used to inspect temple cleaning and if He would see a little particle of dust He would remark, "O, you have not done very nice." So try to follow His footsteps in the matter of cleansing. By nicely cleansing one can get promotion in the spiritual kingdom in some of the Vaikuntha planets--it is so nice. So your program for training your Godsisters is very nice, so do it nicely as you have got experience in arcana. There is no matter if there is a little change here and there--the real duty is love and devotion. But you say that the women with children make their schedules around their children. That is the difficulty for family men, their first worshipable object becomes the children. What can be done? You are fortunate that you have got Krsna as your son. The slides which you have sent of recent temple innovations is very, very excellent. One Bengali gentleman from London has sent me a letter praising your decoration of the Deities. The exact words he has used are that one cannot turn his face once turning towards the Deities. I have also seen the slides and my opinion is also the same. Please, therefore, go on getting credit for your service to the Lord. I am very much happy to learn it. Does your husband sometimes help you in this connection or not? I think he should be also trained up so that one day in a week he may also take charge of the Deities although he has got many other duties. Yes, I have received the article from the Swedish newspaper. I could not read it, but it appears to be very nice. I have also received the two articles on the Rathayatra festival. Thank you very much. Please accept my blessings. I am so glad to receive your letter dated Berlin, 13rd July, 1970, and I am so glad also to learn that you have nicely appreciated our Sankirtana movement and now you are married to one of our devotees, Krsna das. You are very fortunate to have found contact with Krsna through Krsna consciousness movement and, yes, peace is only to be found where there is Krsna consciousness. I have been very happy to accept you as my initiated disciple and your spiritual name is Indrani devi Dasi. Indrani is the wife of Indra the king of the heavenly planet. I have received your beads and have duly chanted upon them. Now they are returned to you by separate air post. Please follow all the rules and regulations of Krsna consciousness and chant at least sixteen rounds of beads daily, chant Hare Krsna mantra always, go on Sankirtana as often as possible and be happy. I know that you are a very suitable match for Krsna das. You are both young, intelligent and sincere devotees. So please work combinedly with great enthusiasm to establish our branch of ISKCON in Berlin. That is my desire. Regarding your question why does the moon appear in pictures of Krsna yet the abode of Krsna is described as having no need of sunlight or moonlight, the answer is that these pictures show Krsna as He appeared in Vrndavana 5,000 years ago. It may be understood therefore that it is the moon of this world which is seen along with Krsna in these pictures. Please try to read our literatures very carefully and try to understand the philosophy with the help of your good husband. I am enclosing one sheet listing standard practices and qualifications of a devotee and ten offenses to avoid in chanting, for your reference. Please accept my blessings. I beg to thank you for your letter dated 14th July, 1970, in Bengali, and you will excuse me for replying in English to save a little time. Nowadays I am not keeping very good health and very soon I may return for a change in India. I have received no Panjika from your side, neither I have any information from New York. So it is too late now, you need not send any more copies. Regarding magazines, please inquire from Acyutananda. Please offer my obeisances to all Vaisnavas. Thank you very much once more for your kind letter. Herewith please find a copy of our booklist. N.B. Please offer my obeisances to Srimad Narayana Maharaja. I have not heard from him in a long time. Please request hm to find out a large piece of land perhaps with a house, between Mathura and Vrndavana, for purchasing. Please accept my blessings. I beg to acknowledge receipt of your letter dated 20th July, 1970, and noted the contents. But it is the old story. Anyway, I am hoping against hope that very soon we shall have a place either at Calcutta or at Mayapur. Kindly keep me informed of your activities at least twice in a week, otherwise I become very much anxious and due to my blood pressure sometimes do not eat, do not sleep. I am just trying to organize a worldwide movement not for any personal ambition but to execute superior orders, and by the grace of Krsna we are getting good encouragement. So I request my students to cooperate fully. As soon as I hear from you that we have got some place, immediately I shall go to India for a change, with two Sannyasis. Recently I have given Sannyas order of life to six Brahmacaris. They have been sent in different parts of the country for preaching work and two of them might to with me to join you. So immediately we require a place of our own. I am very glad that Acyutananda's doing nice preaching work. Offer my blessings to him and I wish to hear from him also along with your next letter. Please accept my blessings. I beg to acknowledge receipt of your letter dated July 17, 1970, along with one letter from your new wife. I am very much encouraged that you have seriously taken up the matter opening our center in Berlin city and it is a great opportunity for us, I have also received the beads and I have chanted them duly. I am sending them back by separate air post. and the letter addressed to your wife is enclosed herewith. I am so glad that you are at last happily married. Now utilize this nice opportunity of working combinedly in the service of the Lord. You both have all my blessings for working on in spreading Krsna consciousness movement to the German people and elsewhere in European countries. I think your wife will be of great assistance because she is a fluent linguist. I have given her the spiritual name of Indrani devi Dasi. It is good news that you are so quickly successful in your Sankirtana and distribution of literatures in Berlin. I am sure that this so large city will prove a very important center for European ISKCON activities. Thank you for your keeping to our regulated program of chanting, study and Sankirtana, etc. If you simply stick to this program which I have given you in so many ways, you will come out successful in your mission, of this there is no doubt. So do it very seriously and enthusiastically and receive the blessings of Lord Krsna for your sincere efforts to spread His Holy Name. Please accept my blessings. I am in due receipt of your encouraging letter dated 19th July, 1970, and noted the contents. I am so glad that you are now happily combined with Sriman Gopala Krsna, and I think this match is just suitable for you both. You were wanting a very nice responsible devotee husband and now Krsna has so blessed you, please utilize this opportunity nicely and advance mutually in Krsna's transcendental loving service and be happy. Yes, it is very good work that you are doing by making children's books on Krsna conscious subject matter. We have got so many children now in New Vrndavana and it is also learned that in England and Holland the young grammar school boys and girls are eagerly taking to this process of chanting Hare Krsna. So what is learned in the early years of life will not depart for the whole life, therefore do this work very carefully to explain simply and directly Who is Krsna, who we are, what is the material world, what is the relationship of Krsna with the living entities, how we should act in that relationship, etc. And if you can illustrate these books with pictures they will certainly become very, very popular in the schools. Sriman Yogesvara is also doing this work in London. So in consultation with your husband make some nice Krsna conscious children's books and we shall then see to printing them. You are also a skilled painter so I think this venture will be successful. Yes, I am so glad to know that the St. Louis temple is doing so well. I know that Sriman Vamanadeva and your sister, Indira are a very exemplary couple in Krsna consciousness householder life, so you kindly follow their example. Regarding your questions, the first answer is that it is correct that the body transcendental of Krsna and Krsna Himself are nondifferent. So what is the difficulty to understand that the soul of Aghasura merged into the body of Krsna? In other words Krsna benedicts the demons Whom He kills personally with the impersonal liberation of merging with Him. There is a difference between the activities of Krsna which are exhibited to the perception of the conditioned souls in this world and His activities in Goloka Vrndavana. Because Krsna was playing as an ordinary human being, His activities here appear just like ordinary human activities, but in the Spiritual Sky there is no such requirement. There in the spiritual sky Krsna has His activities also but they cannot be understood by the conditioned living entities how they are going on without any resemblance of the mechanical workings of things in this material world. In the Spiritual sky and in the material sky also there is no question of separation from Krsna. Krsna is all pervading, so where can one be out of His presence? Whatever has to do with Krsna is on the spiritual platform and on that spiritual platform there is no difference between being together and being apart from Krsna. So even in the feeling of being separated from Krsna, Krsna is there. So far the Avataras are concerned there are two types. One is called nitya and the other is called naimittic. Nitya means eternal and namittic Avataras appear for some specific function in the material worlds. Nitya Avataras have their eternal abodes in the spiritual sky from which they may sometimes descend to the material worlds, but naimittic Avataras are expansions of Nitya Avataras for some timely purpose. So the non-human forms of Avataras do not have their planets in the spiritual sky. Yes, Mahesa Dama is in the spiritual sky. That is described in the Srimad-Bhagavatam and Brahma Samhita. At the time of dissolution of the material worlds, Lord Siva remains in His spiritual abode while the cosmic manifestation merges into the body of Mahavisnu. Regarding the activities of such great sages and devotees like Parvat Muni and Parasara Muni begetting children, such activities of these elevated souls are not to be questioned by us. They have a higher purpose which we cannot determine; therefore it is said in the Srimad-Bhagavatam that one should not try to imitate the actions of the Isvaras or those who are very powerful, but one should follow their instructions. I am very glad to know that you are reading our literatures and you are very thoughtful about them. I am always happy to answer your questions, but you should practice to get the answers from your husband and try to find them out by reading further in our books. All questions will be clarified if you simply read our books very thoroughly and follow the simple process of devotional service as we have given it to chant regularly and rigidly observe the rules and regulations. This is our principle that the spiritual science becomes revealed to the devotee from within the heart according to the degree of his surrender to Krsna. You are a very hopeful student and intelligent devotee, so you continue to pursue your devotional activities patiently and Krsna will open your path of Krsna consciousness so you will progress more and more. Please accept my blessings. I thank you very much for your letter dated 23rd July, 1970, and the two copies of the Krsna Consciousness Handbook. It is very nice, although the color pictures are not very clear. But one blunder has been done on page 98 about the London Temple being printed backside so Lord Jagannatha, Lord Krsna, Srimati Radharani, everyone, has changed His position. I do not think there is any possibility of rectifying now, but in future please take special care for this. There are some discrepancies on the front cover of BTG #34 which I have pointed out to Brahmananda Maharaja. You have not mentioned anything about your other activities in the press. By the by, please dispatch one copy of this Handbook to the following address by air parcel. Please accept my blessings. I beg to acknowledge your letter dated 20th July, 1970, along with the blueprint for chapter 4 Second Canto Srimad-Bhagavatam. I have gone through the blueprint and I am also sending the necessary Sanskrit corrections to Pradyumna. So when these corrections are made then you can print immediately. Yes, I am awaiting for the propaganda photographs which you are sending. Hope this will meet you in good health.